Yup, I believe the convict is right (he has a mom?). Looks like a short trigger to me too. If memory serves Greg is partial to the short triggers. At least in one mode, for carry or for target, don't remember which. I too would love to see the collection, some cool stuff. Might call it an accumulation perhaps. Convict has a mom huh? My mom tells people she found me under a rock and oft times wishes she'd put me back. Guess I should feel bad but I've lived with it all my life, kind of accustomed to it I reckon. Greg the convict wants me to tell you that it looks like you also "sliped" in a short trigger in that TRP! Now you have renewed his desire for a TRP that has been simmering in the back of his future gun list!!!! He has a good eye, I did swap in a short trigger. I can live with medium length triggers, but prefer the short. It sure would have been nice to see you all this winter, but I agree about sticking close to home. Hopefully next year! Please say hello to your badman for me. The convicts Mom grew up on a potato farm (TRUE) and she found him under one of the potato plants.......................and she likes potatoes so she decided to keep him. BUT, she found out that one rotten potato can spoil the whole crate! Not true, he's a good guy, I'll keep him! Yes, we were very disappointed that we won't be traveling this winter, but that's life. Lord willing, it will happen next year! Keep your brass polished and your powder dry! Say hi to the wife!! I don't know pal, looks like it might make the cut for BBQ gun to me. 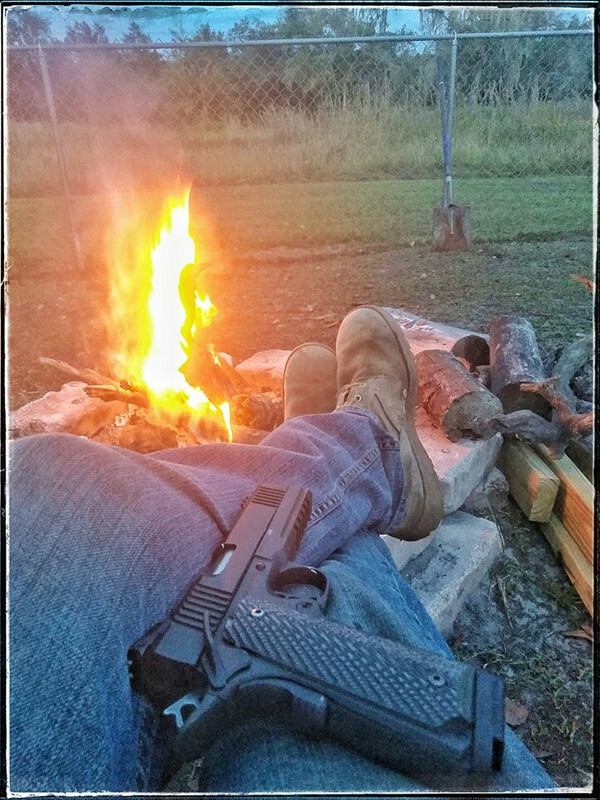 If there wasn't a campfire gun category, there should be. I'm a little late to the party.....as a matter of fact I just got here! Anyway, I prefer the grip screws that are (or maybe were) sold by 10-8. The slot was cut so that they could be unscrewed by using the rim of a .45ACP case. One of the demonstrations of John Browning's genius is that the 1911 pistol can be detail-stripped by using no "tools", other than the part that you've previously removed. Even, for example, the little lock screw on the magazine catch can be removed by using the little bent tab on the sear/trigger spring. Torx or Allen-head grip screws sort of go against Saint John's principles! True, the 1911 can be mostly disassembled using other parts of the pistol, but there are parts that you would play hell getting off that way (sights, grip screw bushings, barrel link pin). So, I disagree that Torx or Allen head grip screws go against Saint John's principles, but rather that they fly in the face of the Gospel according to Hilton Yam. I'm not knocking your choice of grip screws, but I've carried many other types of firearms afield that require tools to disassemble (or even tighten the grip screws) and have not been handicapped by that. I've also not been plagued by loose grip screws on my 1911s, so I've decided to go with what looks good to me. Bawanna might understand that. BTW, the above doesn't mean I don't think slotted screws don't look good on a 1911. I just think they are a better look on some guns rather than on others. Earlier, I posted a photo of a second set of grips that I got with the stag; well I finally got something I felt they belonged on at this weekend's gun show. Perfect home for them. Didn't know Ruger made a rail gun either. Looks nice!